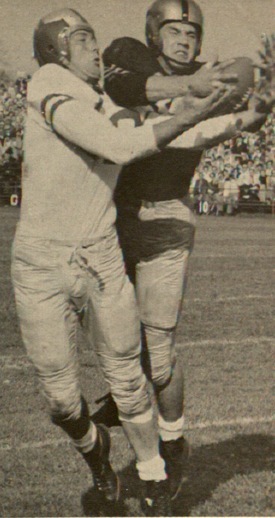 Football: 1963 football preview – A look back at the 1963 football preview. 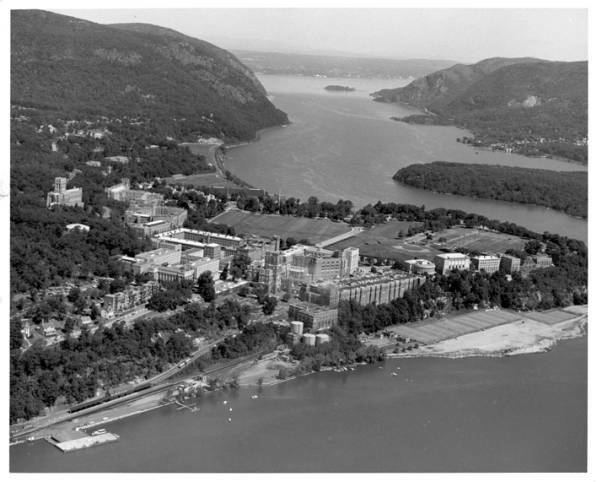 The day after Army took that pasting from Navy for the fourth straight year, Paul Dietzel and his troops stopped for lunch on the mournful drive back to West Point. 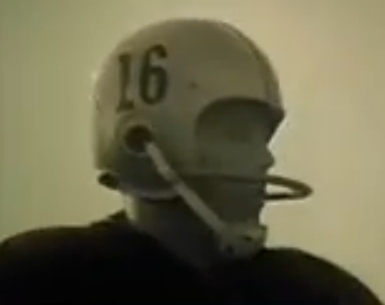 In a Jersey roadside restaurant the business of finding a new quarterback, some kind to answer to Roger Staubach, began. 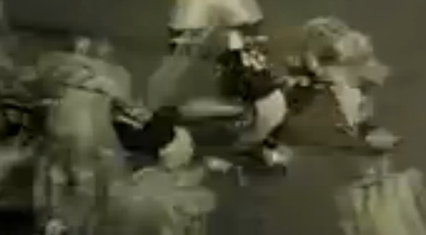 “It wasn’t a happy lunch,” recalled Dietzel yesterday. 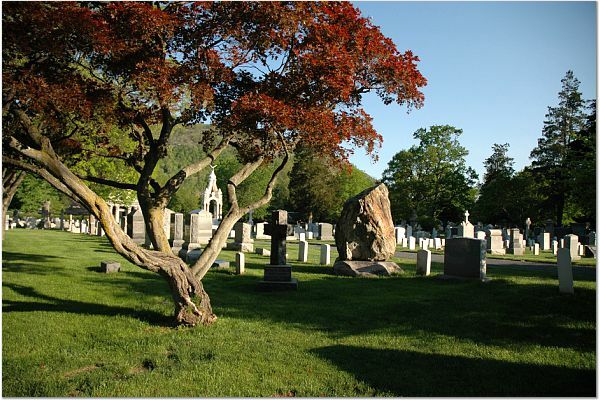 “Every detail of that horrible debacle was, still is, firmly engraved on my mind. 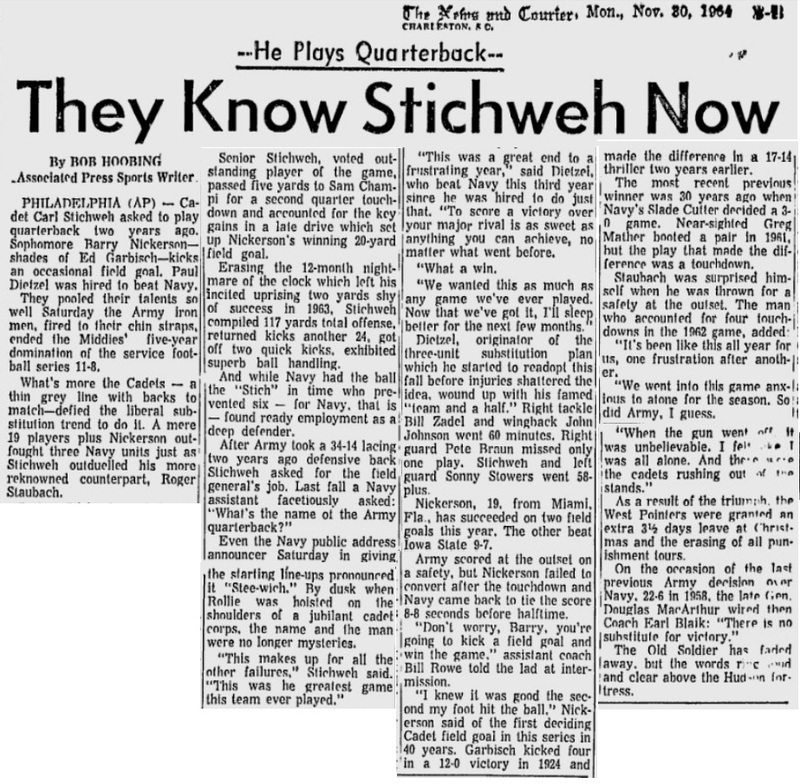 Rollie came to our table and said, ‘Coach, I think I can do the job at quarterback; can I have a try at it?’ And I said, ‘You’re dad-burned right you can have a try.’” The next day Carl Stichweh of Williston Park, L.I., who is Rollie, began warming up the arm which had been rusty since he quarterbacked Mineola High. 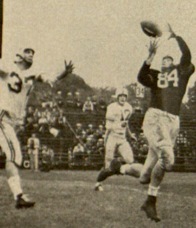 On a handball court through the winter he played pitch-catch with Cammy Lewis, one of the three graduating quarterbacks and in the spring Rollie hammered down his claim to the job, proving he was a passer, completing 85 per cent (no one is that good in a game) and taking off as a runner on options. 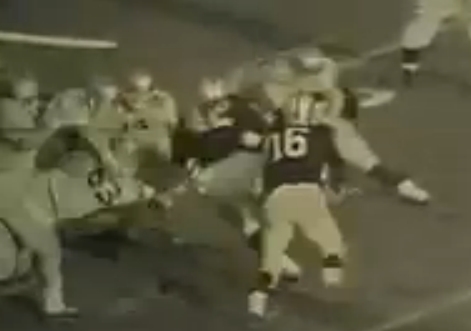 Navy’s Staubach, but the QB problem is the one Army has to lick with new men. In a Capsule New quarterback and health of ends are keys to improved offense, while Dietzel dotes on middle of interior line. Formation used: Flip-flop-split-end T with wingback. 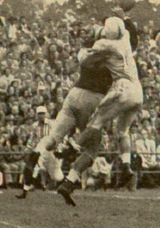 1963 Schedule: Sept. 21, Boston U.; 28, Cincinnati. Oct. 5, at Minnesota; 12, at Penn State; 19, Wake Forest; 26, Washington State; Nov. 2, Air Force at Chicago; 9, Utah; 16. at Pittsburgh; 30, Navy at Philadelphia. 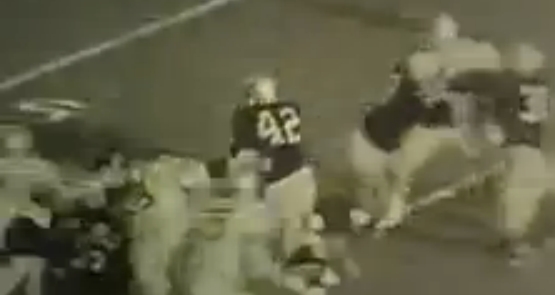 News alert – look for the upcoming, Nov 14 2013, CBS documentary on this memorable game! 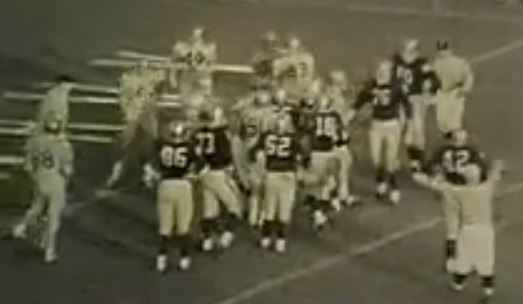 This writer believes Stichweh’s play that day was the greatest all-around performance of any Army player – judge for yourself in this collection of snaps from the above video – from running, throwing key blocks, scoring TDs, tackling on defense, scrambling for a two-point conversion, recovering an onside kick, and running and passing on a thrilling late drive – and DIGNITY and CLASS in DEFEAT – Stichweh did it all that day!!! Stichweh personified the very best expected of an Army athlete. 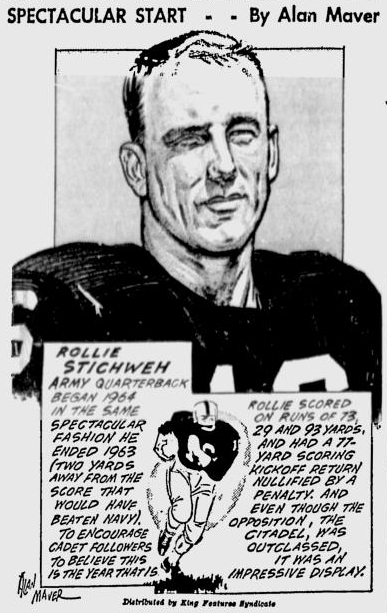 Until Army Quarterback Rollie Stichweh struck again last week, this time as his team defeated stubborn Boston College by 19 to 13—and this time with, of all things, his passing—it was not important for college football enthusiasts to know that his name is pronounced Stitch-way instead of Stick-wee or Stike-web. 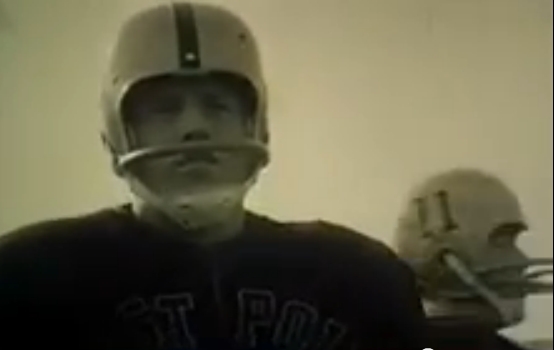 Nor was it terribly urgent for anyone to begin pondering whether the West Point first classman might be this season’s Roger Staubach since, apparently, Navy’s Staubach is not. Now, however, all matters concerning Stichweh may properly be deemed urgent because he has proved, through two games, to be the fastest-striking player in the U.S. 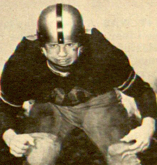 In the 18 precious times he has found himself alone with the football Stichweh has averaged 22.5 yards per carry in seven scrimmage runs; completed seven passes out of eight for 85 yards; returned two punts and one kick-off for 108 more yards. In all, he has advanced the ball 352 yards and accounted for 24 points, running and passing. More important, Stichweh has performed these feats in only 30 minutes—19 of them coming in Army’s 34-0 victory over The Citadel and 11 more against BC last Saturday. It is, therefore, not entirely facetious to suggest that Stichweh, at this rate, may become the first All-America who will not play enough to earn a letter. 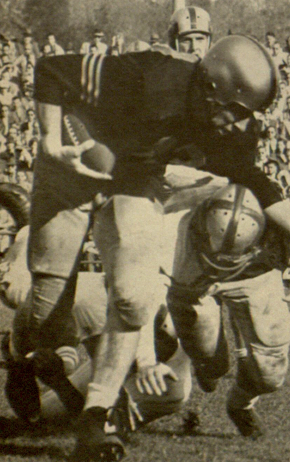 The Army quarterback would have played more against Boston College had it not been for two things: a very minor bruise on his left ankle that occurred in the second quarter and Coach Paul Dietzel’s conservative nature. It barely was. Stichweh directed a perfect 73-yard drive the first time Army got the ball, running himself for two critical first downs, and hitting four out of four hook passes, the last one going nine yards to End Tom Schwartz for a 6-0 lead. 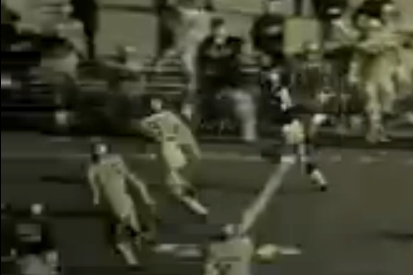 In the drive Stichweh displayed a surprising talent for throwing the drop-back pass. His best play is a sprintout run-pass option when he fakes to the fullback and follows both pulling guards. He is a fast as well as clever runner. But against Boston College, Stichweh took three quick steps wide, then settled into the pocket and spiraled accurately to receivers who had run moderate down-and-in patterns. At this point, it looked as if Army would have a remarkably easy afternoon against a heavier, more experienced team that had shocked Syracuse 21-14 the previous week. 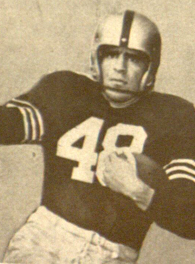 But as it turned out Army needed a good performance from Stichweh’s stand-in, Frank Cosentino, and a chilling 94-yard punt return by sophomore Halfback Fred Barofsky to survive a spray of fourth-quarter Boston College passes. 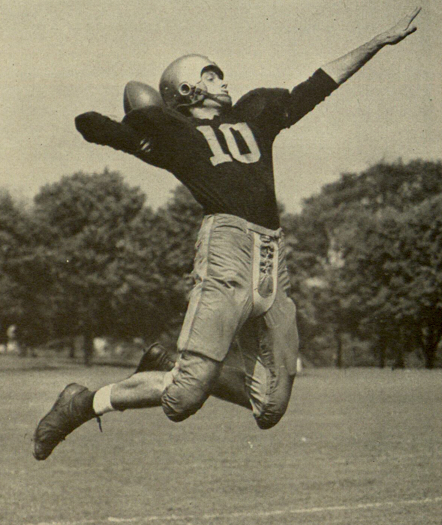 In that last quarter Ed Foley, a quarterback who had never lofted a varsity pass, completed 10 of them, sweeping BC to two touchdowns, and he was still connecting at the Army 40 when time caught him. 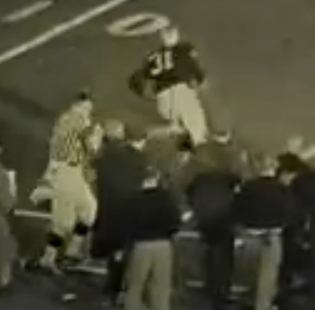 Throughout the barrage the thought in Dietzel’s mind, as he paced the Michie Stadium sideline with his clipboard, was that Rollie Stichweh, of course, could have had the game more safely out of reach. 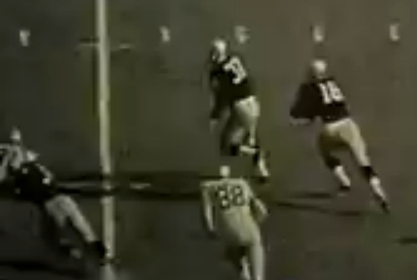 Before the last game of 1963, the Navy game, it appeared that Stichweh might be better off in another position. 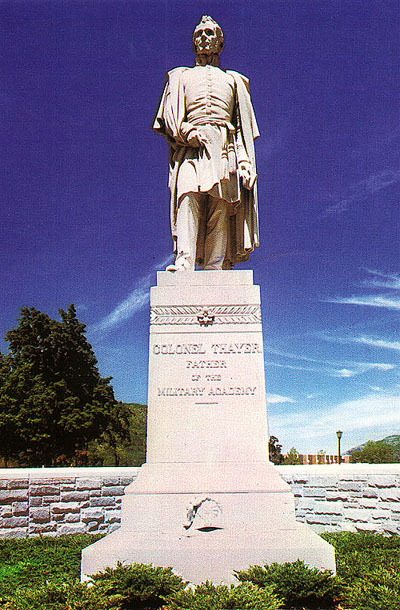 Although he had been recruited as a passer (from Mineola High School on Long Island in a battle involving such outrageously incongruous bidders as Princeton and Iowa), he had never convinced anyone at West Point of his skill. 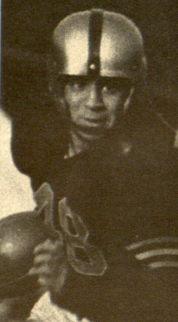 He played defensive halfback as a sophomore, and through most of last season he was regarded as a quarterback who could certainly run but passed only at saber point. 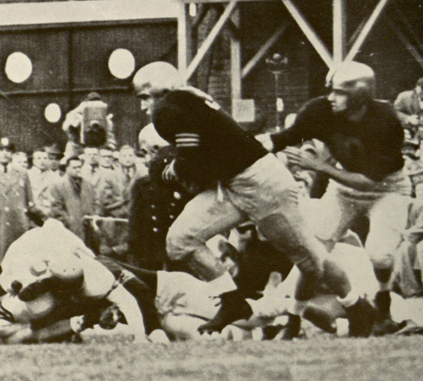 Then against Navy he demonstrated something Dietzel termed more important than running or passing: leadership. “The ability to lift and inspire,” says the coach. 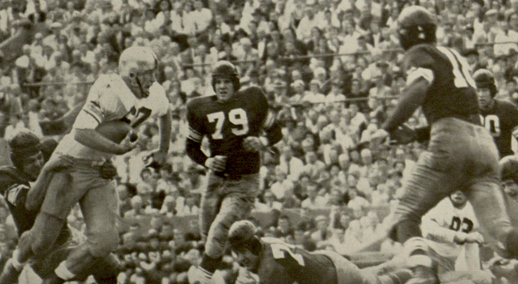 “He was even voted the outstanding platoon leader this summer at camp.” On that day in Philadelphia, although Navy staggered through 21-15, Stichweh outdueled Roger Staubach, scoring 14 points and bootlegging Army to the brink of an upset. 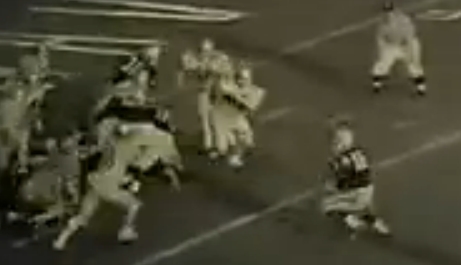 Stichweh grabbed the quarterbacking leadership just in time, too. 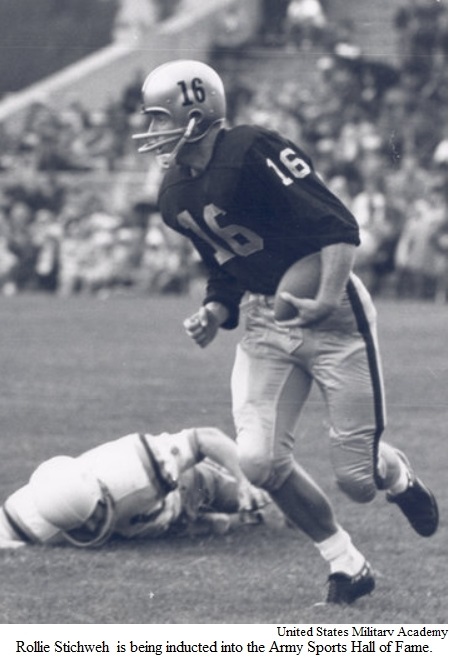 With Staubach off to a slow start—he has completed only eight out of 16 for 69 yards and has lost 14 yards rushing—the service academies seemed fresh out of heroes. Rollie should do very nicely until Roger regains his form. 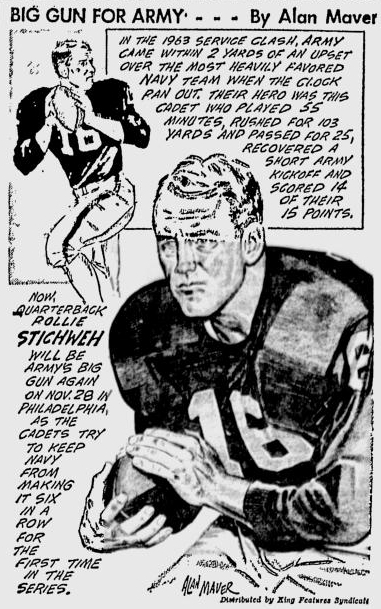 PHILADELPHIA, With the whole-souled cooperation of an old-fashioned Army team that disdained platoons and free substitutions, “Rollie’s Redemption” played a smashing one-stand performance before a full house of 100,000 In John F. Kennedy Stadium yesterday. 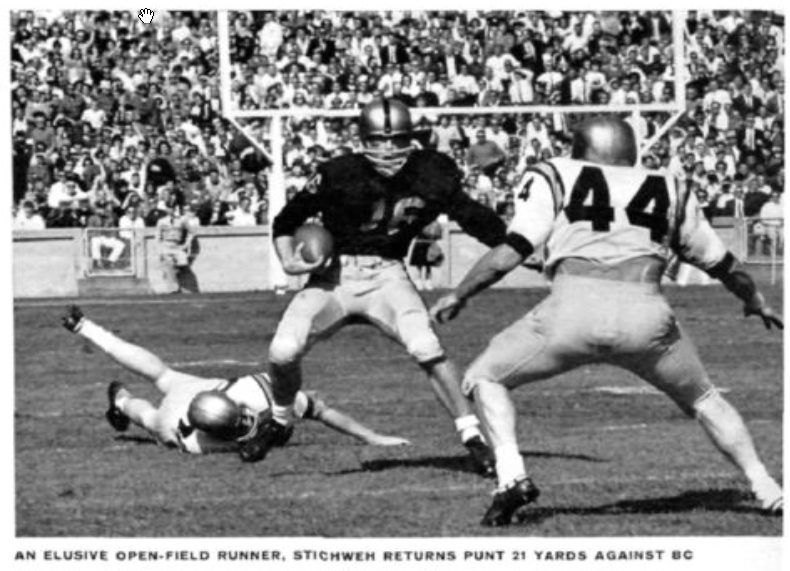 Army and Carl Roland Stichweh, its indefatigable captain, quarterback, top runner, passer and defender, finally caught up with Roger Staubach and Navy and beat them, solidly, convincingly and as decisively as one can in an 11-8 score. 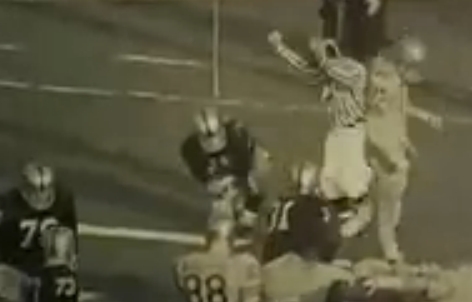 It was the first time in 30 years that the service game was decided by a field goal. 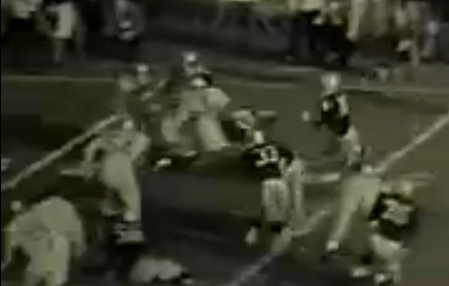 In 1934 Slade Cutter’s placekick was the only score as Navy won. 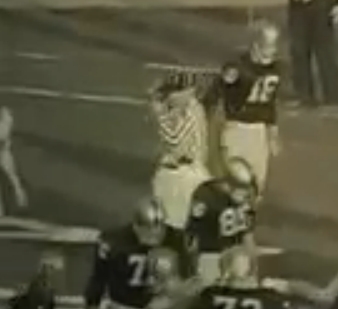 The grim and resolute underdog Cadets, getting even with tormentor Staubach in his varsity farewell, harrassed, harried and hopped on him first to last. They wrenched a safety from him in the first 53 seconds of the ball game by chasing him 13 yards into the end zone and mobbing him. 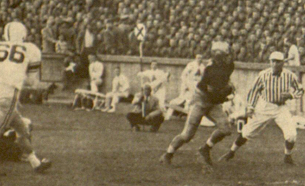 They dominated the action of the first half for 20 minutes, swiftly marched 54 yards to a touchdown on John Seymour’s two bolting runs and Stichweh’s five-yard pass to Sam Champi; opened the door to Navy’s tying points 25 seconds before halftime on an egregious holding penalty on a Middie punt, then marched 77 yards to set up sophomore Barry Nickerson’s deciding 20-yard field goal in 5:30 of the fourth period. This bare skeleton of the scoring provides the outline of the important story on the scoreboard but fails to flesh out the tension and drama of the 65th service battle. 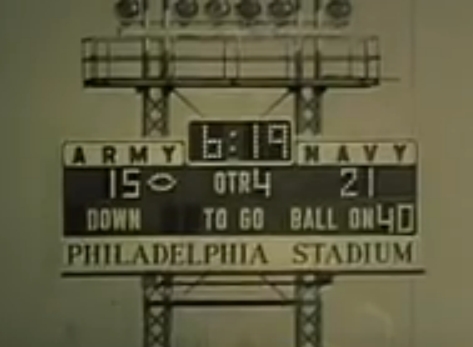 Fumble-free in its execution, and great on defense, Army gave Navy ail the chances to win by violations that brought drastic penalties in critical spots. 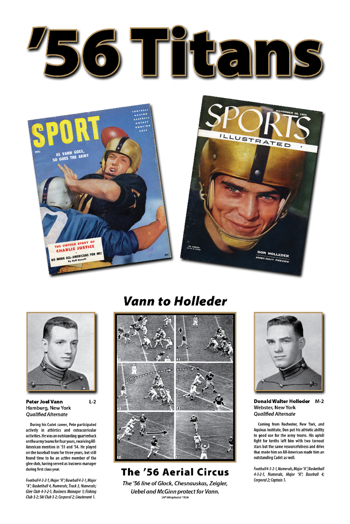 It was a holding penalty on a Navy punt that restored possession to the Midshipmen and enabled them to mount their only sustained drive of the day, their only first-half invasion of Army territory and their only touchdown on sophomore Tom Leiser’s fourth down, one-yard tackle slant. 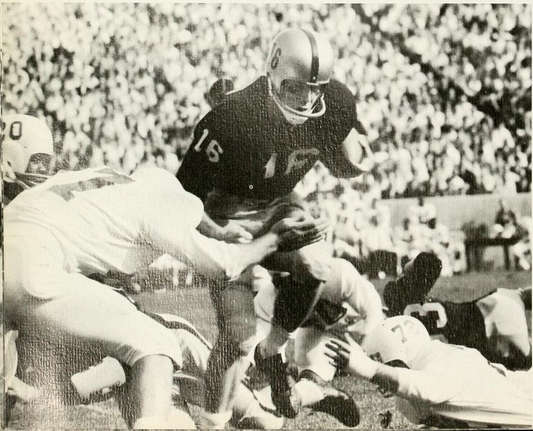 Staubach was penned and cornered and tackled like he never has been by Army and rarely by others in his three varsity years. 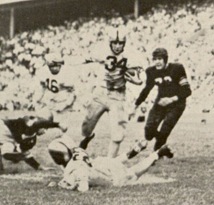 He wound up with minus 22 yards on the day, but he was always dangerous passing (completing 12 of 20 for 110 yards) and he made the two-point play with Champi draped around his neck and, other Cadets clawing at him by getting the ball to Phil Norton in the end zone, with Norton making a falling catch. That made It 8-8 at halftime. 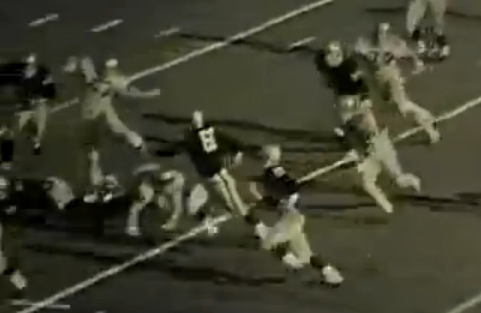 After Army drove so far to regain its lead, the Cadets stopped Staubach again and forced Navy to punt from midfield. 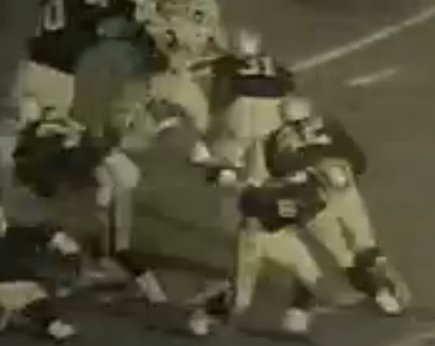 But-big John Carber, Army tackle, trying desperately to block the kick, slammed through Tom Williams to give Navy the ball again for another shot at Army’s 38. It did not seem possible for Army to keep inviting d1saster with one hand and hold it off with another. It was like sitting on a time bomb ready to explode. 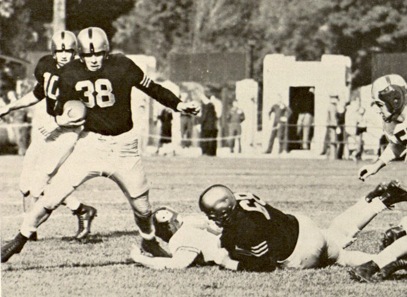 But this Army team, and particularly 14 seniors, had ruled out platoons and convinced Paul Dietzel they could win it the old fashioned way by playing offense and defense in this Age of Specialization, They recovered from that rouging-the-kicker situation by smearing Staubach twice for losses of 11 and 13 yards. 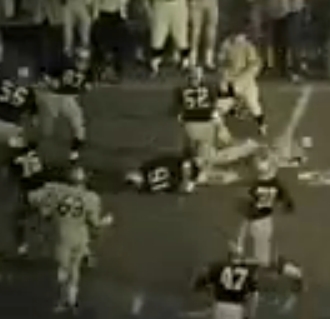 Five or six Cadets mobbed Roger the Dodger, though it was linebacker Don Dietz, then tackle Bill Zadel who pinned him down and knocked out of his reach any chance of either a winning TD for a tying field goal. 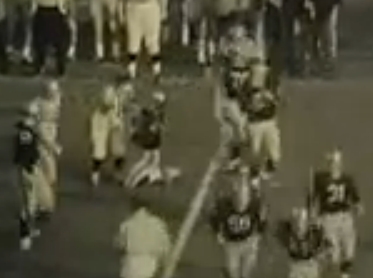 Unlike a year ago when the clock ran out on Army on the 2-yard line with a fourth down coming up, leaving a gallant Stichweh as the goat- holding a huddle and holding the ball- the clock now was Navy’s foe. 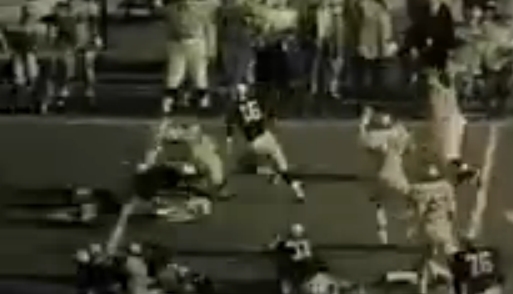 So was Army, which had to give Navy one more series, but creamed Staubach and Co. at midfield. 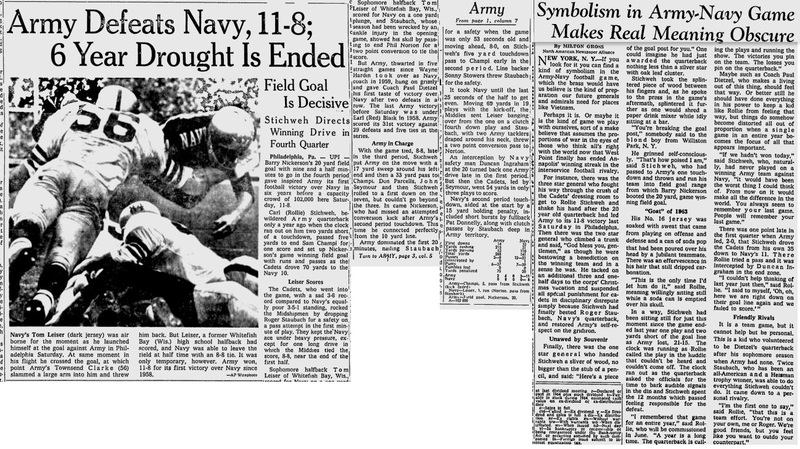 The triumph, Army’s first in the series since Red Blaik said farewell with Pete Dawkins’ unbeaten 1958 team, wrote finis to Navy’s slogans. “Six And Even” just didn’t come off. 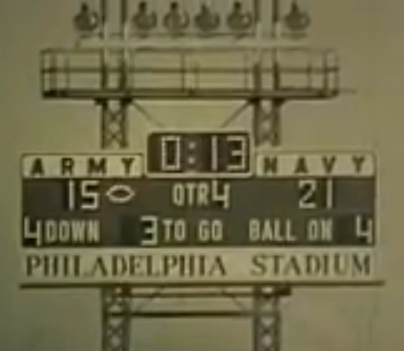 Navy foundered against Army’s rock-ribbed defenses in its drive for a record sixth straight victory in this series, and it did not pull even with Army in the series, which now stands 31-29-5. 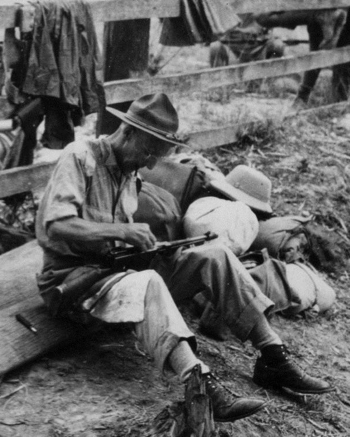 It was the bleakest and grayest of days, but the sun phone bright in the hearts of long-suffering military men everywhere-from generals down to buck privates. 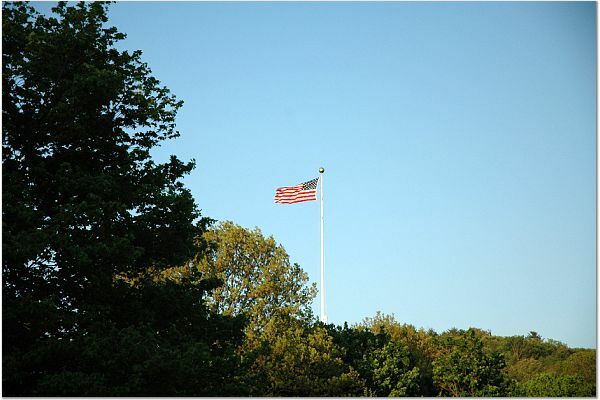 As the clock hands came to zero in the semi-darkness under the inadequate stadium lights, more than half the corps of. 2,700 gray-coated cadets made it from the stands to the field in a whoop and a holler. 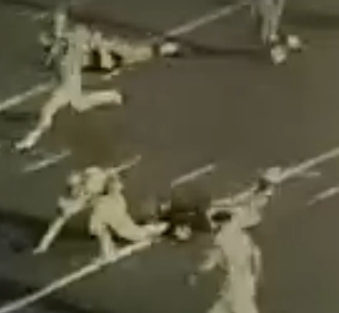 They mobbed the cadet heroes, as the cadet heroes had mobbed Staubach, but with joy in their violence. 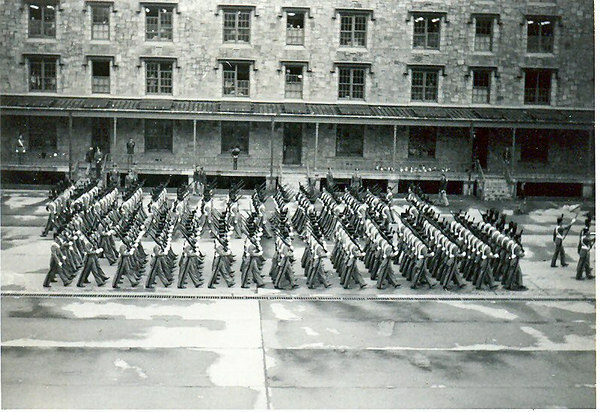 They rode Dietzel, target of so many Wayne Hardin barbs, off the field on their shoulders, and as many of the cadets as they could swing aloft in the subway crush of swaying moving gray-clad bodies. 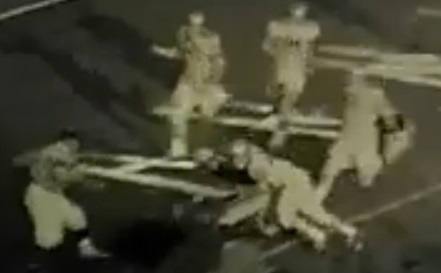 The cadet who deserved to ride highest was ten-foot-tall Rollie Stichweh, 20~year-old Long Islander from Williston Park. Rollie had the last word in his quarterback duelling with Staubabh, his pal on exchange visits between the academies. This was before the Navy game a year ago, and Navy was having a ball. 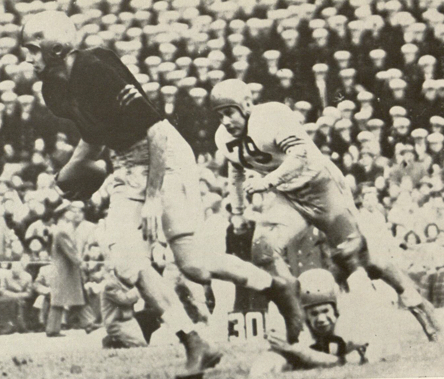 No one had to ask who the Navy quarterback was– a QB who has accounted for 35 Navy touchdowns passing and running, and directed the Middles to eight touchdowns in two successive victories by 34-14 and 21-15. Stichweh, or Stee-witch, played more than 55 minutes (as did four mates; Zadel and wingback John Johnson -went 60 without relief). 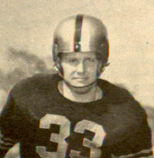 Rollie, who had asked for this job after being a defensive man, as a sophomore, directed all of Army’s attack which, on the ground, crushed Navy, 215 to 31 yards. 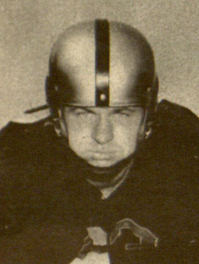 He ran, 13 times on pass options for 64 yards, second only to John Seymour’s 104, completed three of eight passes for 53 yards and a touchdown and was brilliant in his running and passing in the 77-yard march to the winning field goal. He also punted, a new chore, from shotgun formation, a switch from the quick-kick, and he played safety and ran back kicks and tackled. The sequel was Rollie’s redemption. 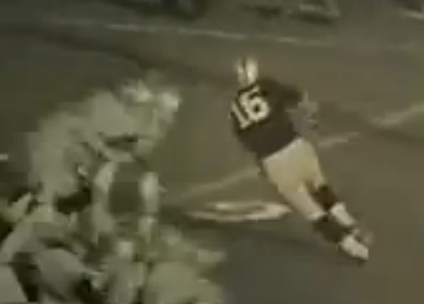 He had all the help he needed from three senior backs – Seymour, Johnson and Don Parcells- who, through injury never had a chance to play a game together. They had their last chance and didn’t muff it. 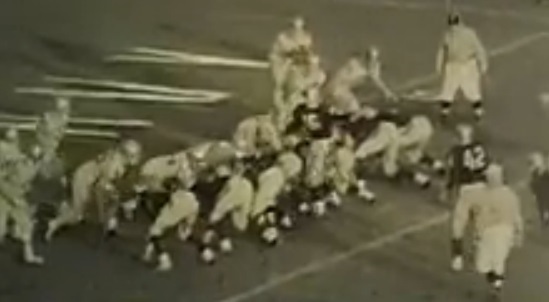 Sonny Stowers and Pete Braun, offensive guards and on defense, linebacker and middle guard, respectively, also went more than 55 minutes to star on the valiant Army line with Zadel, Ron Butterfield, Champi, linebacker Townsend Clarke and others. 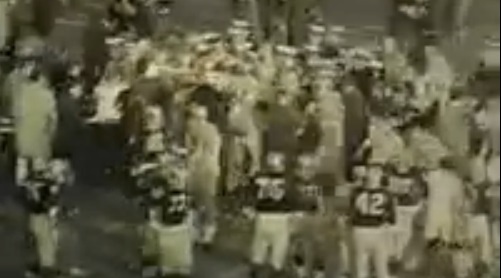 Army decided to play this game straight all the way, old-fashioned on the field, staid off the field. 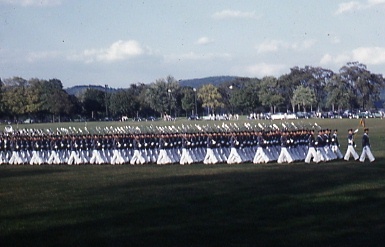 The Cadets were sedate in the stands- no sight gags, no bedsheets, no banners, no slogans. They merely roared defiance at the Midshipmen, who had all the slogans and jibes until the game started. 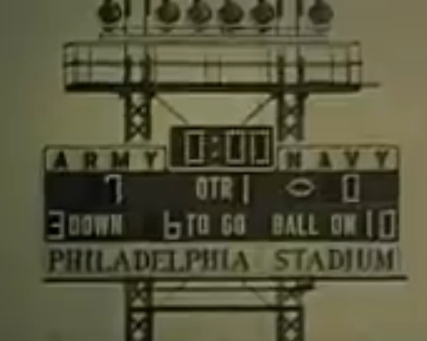 For five frustrating years Army could not handle the only team on its schedule that really mattered: Navy. 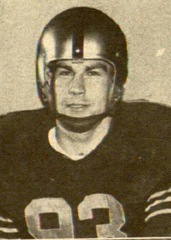 And for the last two of those years, Army’s line quarterback, Rollie Stichweh (No. 16 and pronounced, please. 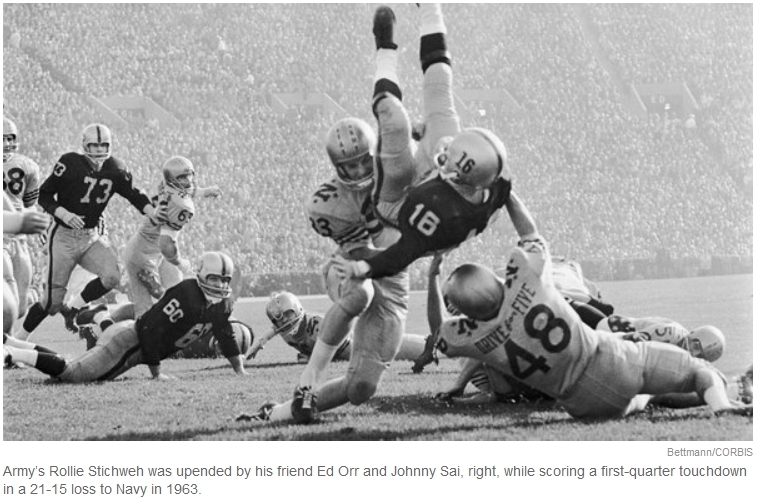 Stitch-way), played second fiddle to Navy Quarterback Roger Staubach, (far left), who seemed able to turn every play into a chariot race. 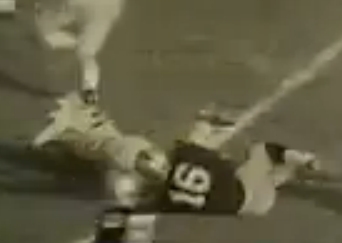 Staubach made All-America, won a Heisman Trophy and relegated most of his opposing counterparts to “Who’s he?” status. But last Saturday Army and Stichweh settled accounts. 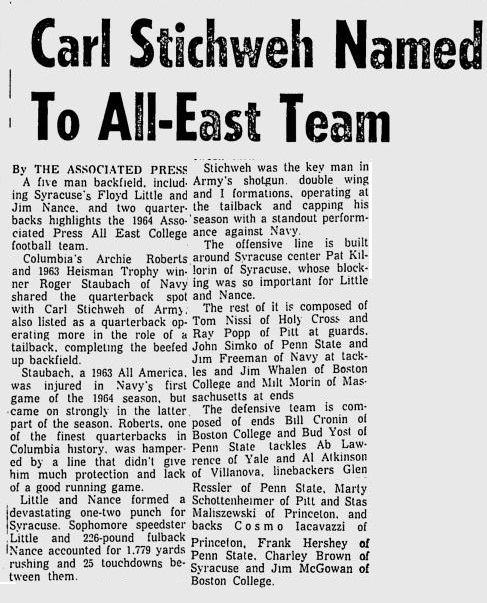 Army beat Navy 11-8, and even though a prankish Navy announcer emphasized Stichweh’s comparative obscurity by introducing him to the crowd as “Stee-which,” the Army quarterback outplayed Staubach as no player had before. 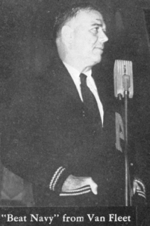 Navy Coach Wayne Hardin may not have helped his cause when he told a pep rally crowd what he thought of Army Coach Paul Dietzel: “I’ve never heard a man talk so much and win so little.” The comment brought only a smile from Dietzel—but it was less the smile of a press agent than of a crocodile. 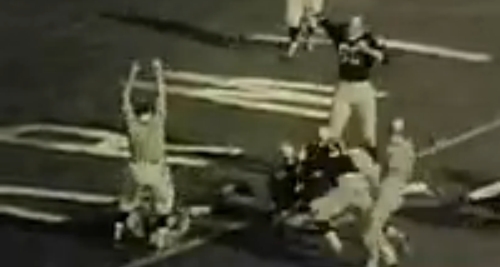 Since early last winter Dietzel had been studying films of the Cotton Bowl game, where Texas almost ate Staubach alive. The lessons were graphic enough. 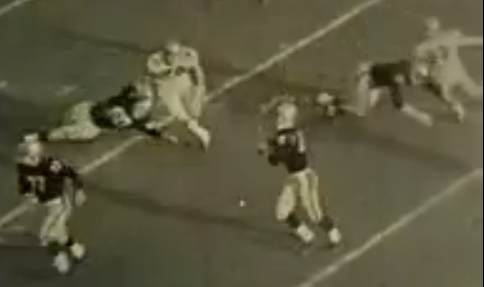 Blitz the agile ends at Staubach while the slow-footed guards and tackles cover the middle. 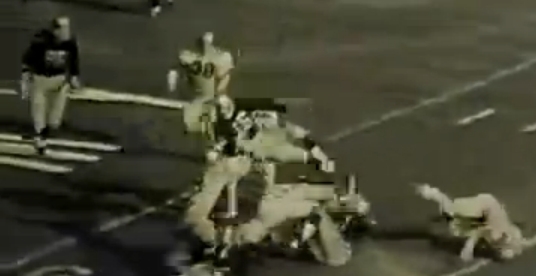 And tackle Staubach high, not allowing him to dance away. 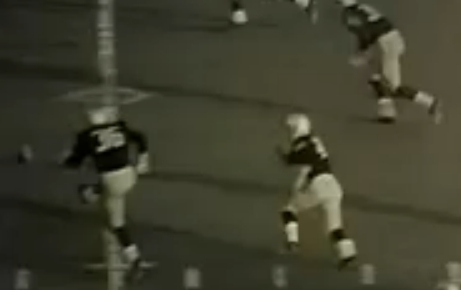 On Navy’s second play, Staubach went straight back to pass. 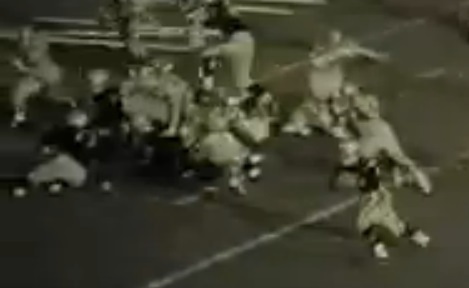 But before he could start his jitterbugging, three Army linemen forced the Navy quarterback into a sitting position. That was ignominious enough, but the worst part was he was sitting in his own end zone—a humiliation worth two points to Army. 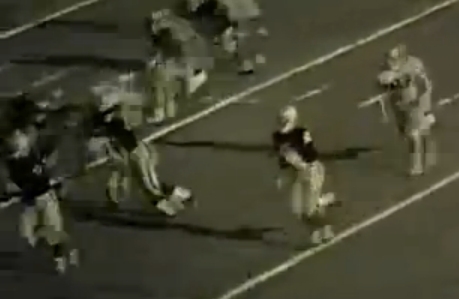 After that Stichweh had the time of his life, sprinting away from the center and skirting Navy’s ends. 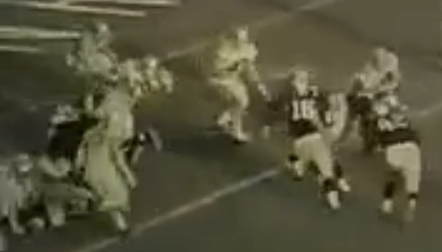 And when Navy adjusted to that maneuver, he either completed soft, accurate passes or deftly handed off to Halfback John Seymour and Fullback Donald Parcells coming back on beautifully executed counterplays that always seemed to gain yardage when the effect was most devastating. 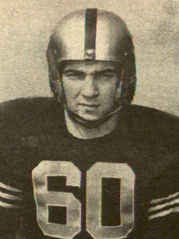 So well did Rollie Stichweh carry out his duties, in fact, that by the game’s end it seemed that everybody among the 100,000 in Philadelphia’s John F. Kennedy Stadium knew how to pronounce the name—at least as well as Staubach’s. 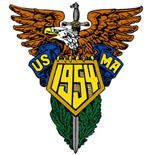 “Selected for induction into the Army Sports Hall of Fame Class of 2012…. 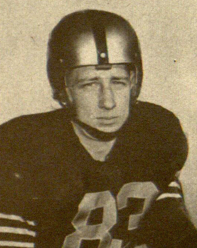 Stichweh was a three-time varsity winner for the football team where he starred as a quarterback, halfback, defensive back and kick and punt returner. 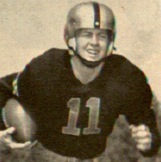 He was twice named Most Valuable Player of the Army-Navy game. 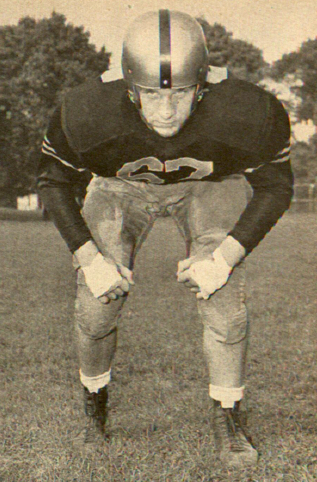 A 1965 graduate, Stichweh completed 52.6 percent of his career passes and was tabbed as an All-East selection. 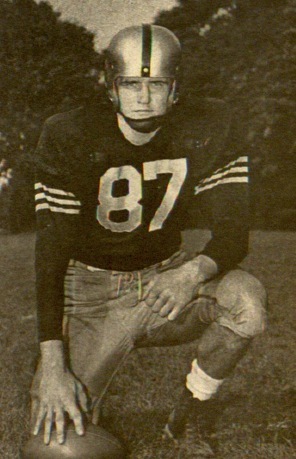 He was chosen to compete in the 1964 North-South Shrine All-Star Game as well as the Coaches All-America Game in 1965. 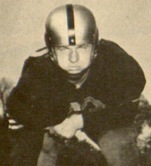 While being ranked number one in his class for physical education, Stichweh was selected by Navy as the “best opposition back in the country.” Stichweh also has a place in college football history after he was involved in the first instant replay during a touchdown run in the 1963 Army-Navy game. 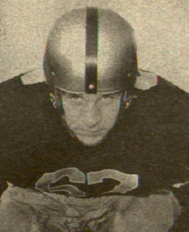 Rollie Stichweh will never forget his final game for Army. 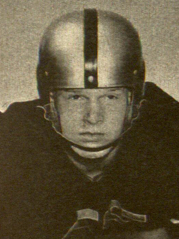 Stichweh, a quarterback, led Army on a game-winning, fourth-quarter drive against Roger Staubach and Navy. 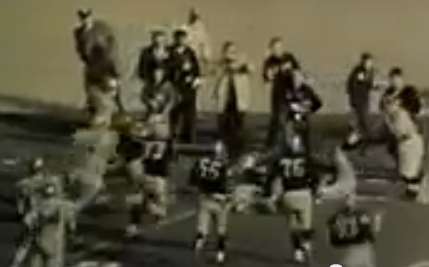 Army’s 11-8 win in 1964 at JFK Stadium in Philadelphia helped Stichweh avenge a six-point loss to Navy a year prior. 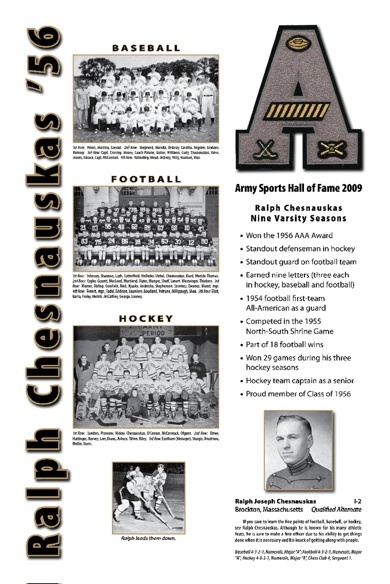 Stichweh will have another big moment when he is honored with six other inductees as part of the Army Sports Hall of Fame Class of 2012 on Sept. 28-29. 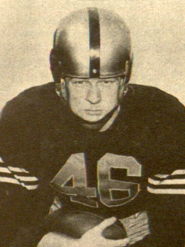 Joining Stichweh is football coach Jim Young, who is second all-time in wins (51) at Army behind the legendary Earl “Red” Blaik and Russell “Red” Reeder. 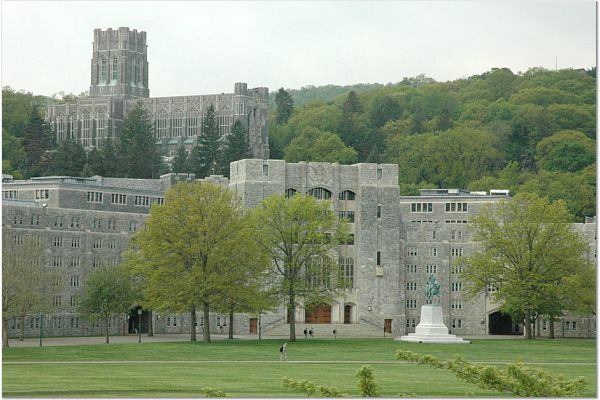 “I loved my tenure there at West Point in many ways,” said Young, who led Army to two of its three bowl wins in school history. “It’s a tribute to all those players that helped turned that program around at that time. Stichweh and Young served on the search committee that recommended current Army football coach Rich Ellerson. 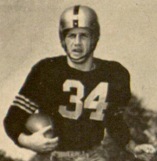 Reeder played running back, tackle, guard and kicker in the mid-1920s. 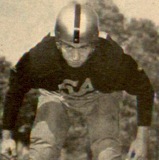 Stichweh looked up to Reeder, who commanded a unit in the Battle of Normandy and received a Purple Heart after being wounded and losing a leg. 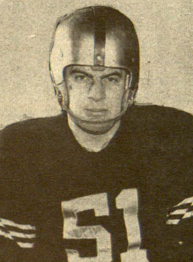 Stichweh was a three-way star. 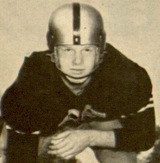 He also was a defensive back and kick returner. 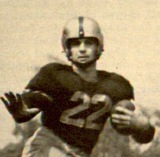 Stichweh rushed for 1,296 yards and passed for 1,270. “In those day, you tried to contribute in any way that you could,” Stichweh said. 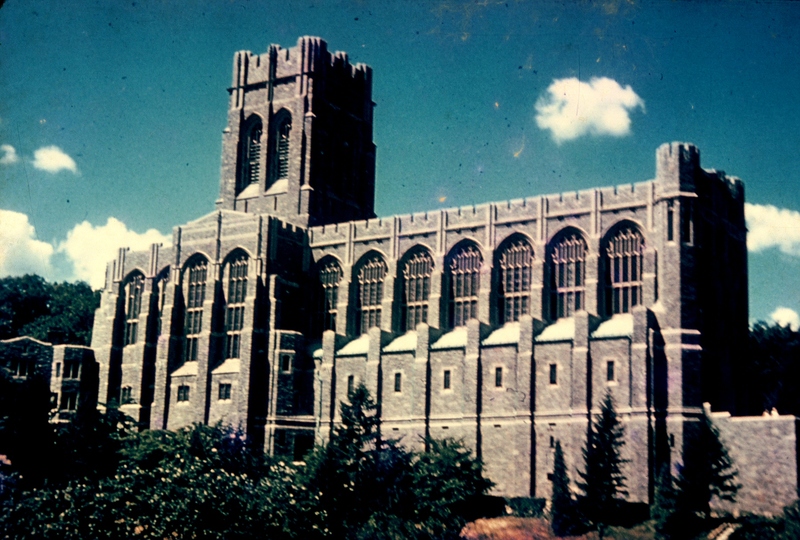 “To be honest, that was the best way to have fun…. 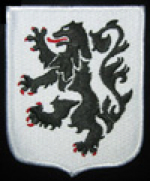 This entry was written by grimmr22, posted on October 12, 2013 at 11:31 pm, filed under Army Greats and tagged 1963, 1964, 1965, Football, Paul Dietzel, Roger Staubach. Bookmark the permalink. Follow any comments here with the RSS feed for this post. Post a comment or leave a trackback: Trackback URL.